Educators in the Flipgrid community are doing amazing, innovative things every day. So we decided to sprinkle a little magic dust on the Flipgrid newsletter to keep up with your creativity! Welcome to the very first blog edition of the Flipgrid Newsletter! We'll update this post every month with all our latest product updates, educator innovation, and community activities. Bookmark blog.flipgrid.com/newsletter to make sure you're always up to speed on what's happening! Keep reading to learn about AppSmash Innovation Month, the glorious return of the Share to Google Classroom button, the all-new Educator’s Guide to Flipgrid, and more! Tip or Treat! With the help of the #Appsmashing King himself, Joe Merrill, his talented partner-in-ingenuity, Kristin Merrill, our Education Innovation Leads (Jornea, Jess, and Ann), and YOU, we’re equipping you with the what, why, and how of #appsmashing to level-up your instruction and spark your students’ magic all month long! 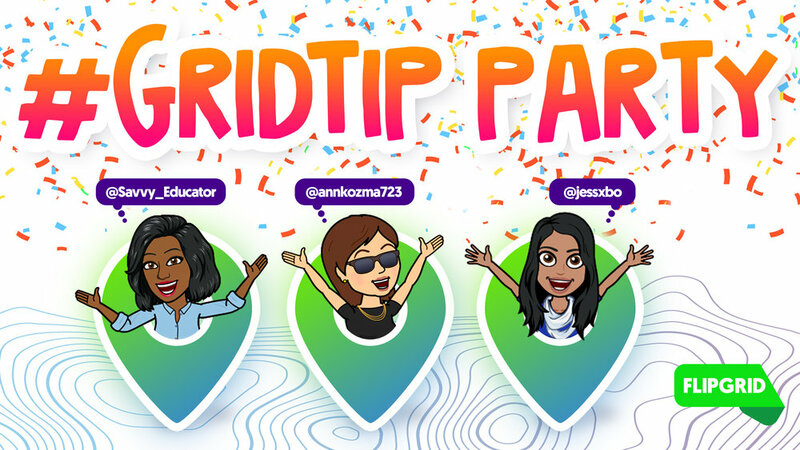 Check out all the details - including an AppSmashing 101 webinar, our first Flipgrid Feature, weekly #GridTips, Instagram adventures, and how you can win a #StudentVoiceIsMagic sticker and #FlipgridVoicePod - over here! Every week we are updating Flipgrid based on your amazing ideas and feedback. Here’s a couple brand new Flipgrid updates! Back by popular demand, the Share to Google Classroom button is BACK! You can share any Topic to Google Classroom from your Educator Dashboard! Incorrect or undesired display name attached to your Flipgrid response? Now you can update it! The greatest way to share the best videos from your incredible rockstars with your amazing families, school, or even community! True to the feature’s namesake, MixTapes is a view-only, curated collection of Flipgrid videos from any of your Topics in any of your Grids. 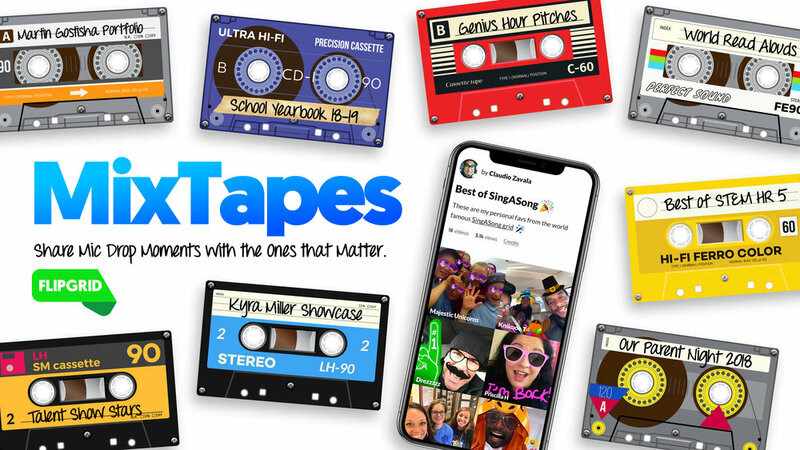 Learn all about the newest addition to Flipgrid over here and check out a series of inspiring ideas for MixTapes over here! Created by educators, for educators, the renowned Karly Moura and Sean Fahey have created a truly incredible, comprehensive, and totally free guide for educators new and experienced! 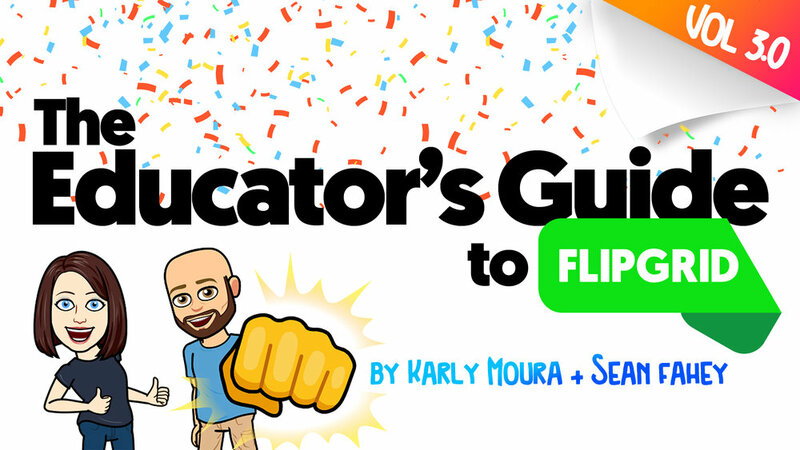 Packed with all the things you need to know to get started and then to blast off with Flipgrid, The Educator’s Guide to Flipgrid, Volume 3 is a fantastic resource to learn more yourself and to share with peers. Their latest guide has been updated to reflect all the new features of Flipgrid, including MixTapes! Celebrate the magic of Student Voice every time you pick up your phone or tablet with these groovy new #StudentVoiceIsMagic wallpapers! Full gallery here. Every day we’re inspired by the awesome ideas shared on Twitter by educators using the hashtag #FlipgridFever. Here’s a couple that went viral this past month! The Flipgrid Explorer Series is an opportunity for you to launch enriched, expert-lead lessons right inside your Grid! The package of stellar Disco Library Topics equipped with exciting lessons, engaging companion activities, and a stimulating prompt for your students can be adapted to meet the needs of your learners, adjusted to align with your curriculum, or simply added as they are. Sean Fahey (yes, THE Sean from the amazing Educator’s Guide above) and Jen Saarinen (the fun and inspiring hero you saw on Twitter introducing families to Flipgrid before it was cool and heard cheering loud and proud for #StudentVoice on the FlipgridLIVE broadcast) have brewed up an incredible inaugural Explorer Series for the school year: MatheMAGIC! Conjure your students’ curiosity and bring math to life with all six of their amazing Topics paired with the amazing Educator’s Guide over here! Join us on the Lone Star #FlipgridBusTour by following that hashtag on Twitter. And, if you are in or suddenly have plans to travel to Texas during the week of October 14th, join us at one of our educator #FlipHunt gatherings, the Texas State Fair, or at TCCA! Thank you to the millions of Flipgrid educators committed to amplifying #StudentVoice and igniting creativity. We are so grateful we get to work with you and we are so inspired by the innovative ways you’re empowering and amplifying your students. Please continue sharing your amazing ideas, feedback, and questions with us on Twitter and via email - we love chatting! 🎃 October is upon us and we’re celebrating the spooky month with unbeLEAFable ingenuity: Happy AppSmash Innovation Month! used more than one app or tool to create something? You’ve appsmashed! leveraged more than one tool to enhance a lesson? That is appsmashing! captured the best elements of two or more platforms to improve learning outcomes? This is appsmashing! To put it simply, appsmashing allows students to create something that isn’t possible with just one tool and ultimately provides endless opportunities for students to show what they know by engaging with multiple tools. ✏️ Appsmashing stretches the imagination for creative thinking. 💻 Appsmashing allows you to push the limits for what’s possible with technology. 💡 Appsmashing engages learners in critical thinking tasks. 💫 Appsmashing brings an element of whimsy and fun to the learning. Tip or treat, webinars, and more: check out all the Appsmash Innovation Month festivities below! 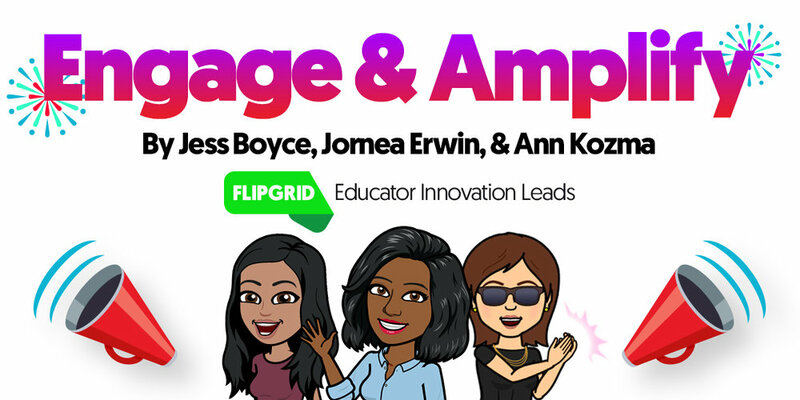 Every week: this month, our weekly #GridTip will focus on appsmashing Flipgrid and a variety of fellow edtech friends with expert tips from the AppSmash King Joe Merrill! Jornea will lead us in a savvy intro to appsmashing with the what, why, and how to get started. Register over here! Our first Flipgrid Feature! 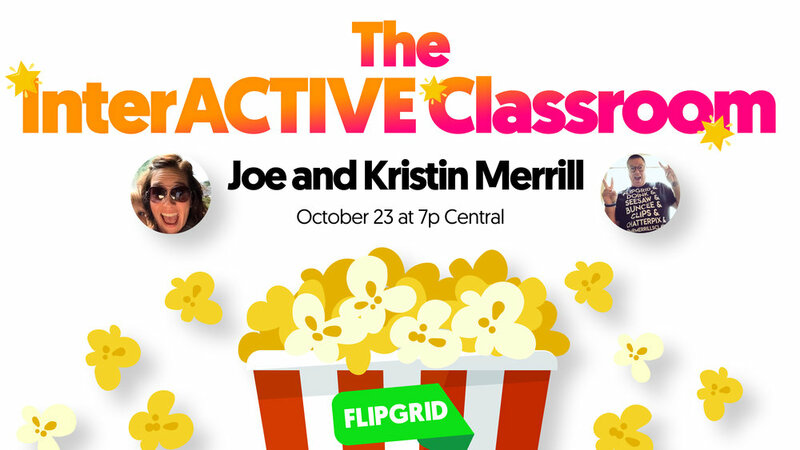 Join Kristin and Joe Merrill as they share their secret sauce for creating mind-boggling, jaw-dropping, double-take activities with appsmashing and more! Register here. Tip or Treat: Follow @Flipgrid on Instagram for daily 🤯 #TipOrTreat 🍫 surprises on our story all month long! #StudentVoiceIsMagic Stickers + #FlipgridVoicePod Challenge, all month long, everyone’s a winner! Head over to flipgrid.com/magic and record your why or how of appsmashing! Everyone who submits a video will win one of the majestic #StudentVoiceIsMagic stickers and every day one lucky person will win a #FlipgridVoicePod! With Flipgrid, the possibilities are endless! We all know that #StudentVoiceIsMAGIC - appsmashing takes creativity to the next level and brings out the innovative wizards, dragons, unicorns… in all of us! Here’s to a freaky fun month of tips, treats, and more! I love the saying “learning loves community!” because it’s TRUE! As I think back to my early education experiences, I was taught to and had little opportunities to learn with. As a result, I struggled with retaining and even caring about the information being presented! As educators, we’ve learned over the years that learning should focus on the learner and that inspiring and creating dialogue within a safe environment fosters growth. With only so many hours in a day, we’ve found discussion protocols to be an effective and efficient way to get students thinking critically about content. However, time, space, and distance often dictate when conversations can occur. Thankfully, Flipgrid can help you overcome these challenges to engage students in dialogue in the classroom and beyond! Replies-to-Responses is fully controlled by the educator and can be toggled-on when creating the Topic or anytime after creation by clicking “Edit Topic” & scrolling to Section 6: Video Features. After viewing a video, students are given an option to reply to the original student’s response by clicking on the reply icon. Their Reply will appear under the original response. NOTE: if moderating the topic, Student-to-Student Replies will also be moderated and will not appear on the Grid until they’re approved by the Educator. 🔮 Let the Magic Begin… it’s easy as 1, 2, 3! 1️⃣ Set the stage: discuss and collaboratively develop expectations for Student-to-Student Replies. Ideas may include listening with respect and replying to ask a question, give an affirmation or extend new thinking with another idea. For example, check out the TAG acronym from Alison Nixon! 2️⃣ Support leads to success: If there are specific requirements you expect for responses, add it to your “Topic Tip” to support students. 3️⃣ Engage & amplify: Encourage students by sharing and showcasing replies. There is even an option for the educator to Add Private Video Feedback for a student Response in the Educator Admin. Either way, the excitement fills up a room when an icon of classmate or teacher pops up under a video. 📖 Connecting through Text: share a read aloud, novel, or article with students to read and explore (TIP: if available via web, attach the resource link as a TOPIC ATTACHMENT for reference). Ask students to respond to an open-ended question and provide evidence from the text to support their responses. This Topic engages students in connecting to the character in “Lily’s Purple Plastic Purse,” asking them if they’ve ever had a similar experience being upset and forgiving someone. 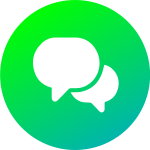 Use the Student-to-Student Replies option for students to give suggestions to others about actions they could implement the next time they may find themselves in similar situations. This topic empowers students to make a difference in the world by creating a “TEDtalk” about a topic that matters to them. Use the Student-to-Student Replies for students to leave feedback about what captured their attention during the talk as well as suggestions for improvement towards the final TEDtalk. 🔢 Explore, discuss and support with mathematical thinking: try out My Favorite No as an activity for students to discuss the accuracy of mathematical thinking. The Topics within the Flipgrid Explorer Series: MatheMAGIC allows students to have in-depth mathematical discourse. For example, in MatheMAGIC 3: Be A Convincer, students will convince others which does not belong. Use the Student-to-Student Replies to have students share whether the other students’ responses convinced them or not by providing evidence for their Reply. 🔬 Compare knowledge gained from experiments, including successes and failures. 🗺 Ask and answer questions to clues from #GridPals! 🗣 Support language acquisition through conversation. Simply have a conversation about a topic in a language being studied. It feels amazing to share your voice and it’s magical to know that your voice is heard, respected, and sparks dialogue. Each interaction creates a stronger community with bolstered care and love of learning within each individual. Enjoy being the catalyst to create this amazing magic with your students!